Novosibersk, Russia. 31st August 2014. Getting to Novosibirsk gave me some breathing space and one of the things I needed to do was to service Doris and fit the new front tyre. I needed a place at which to do it so I contacted Stas, a Russian guy whose details I’d got from the Horizons Unlimited website. I wasn’t sure how he’d respond to a text from a crazy foreigner out of the blue but he replied straight away saying to text him again the next day and he’d see what he could do. 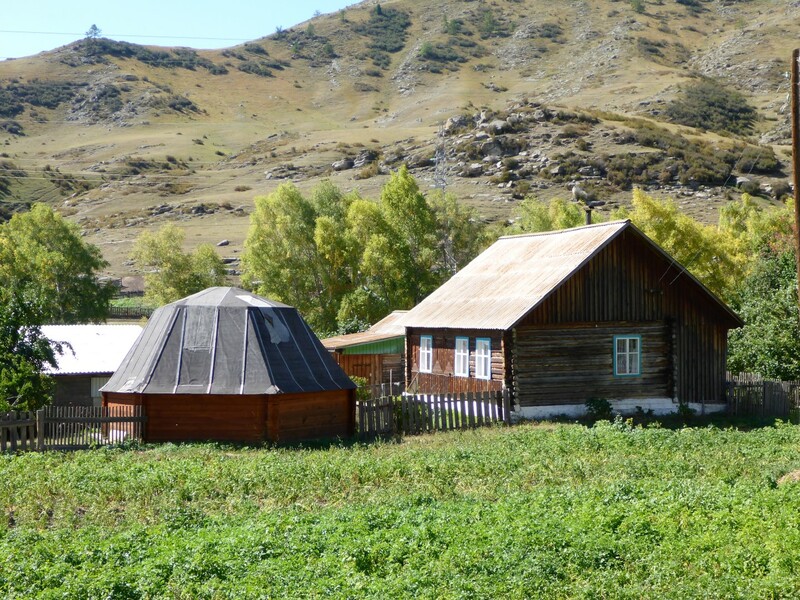 In the meantime I started working on an itinerary for my visit to Mongolia. There’s a huge amount of information on the internet and I needed to whittle it down to manageable proportions and work out a route. I had a quite decent map too, which had plenty of tourist information on it. It showed places such as hot springs, rock carvings, cave paintings and so on. I didn’t have any GPS maps for the country but it was easy enough to get coordinates for various places off the internet. The GPS would then give me a compass bearing to follow. I had a couple of stilted conversations with some of the residents at the hostel, via some broken English and Russian, and aided by Google Translator. The main topic concerned the activities of Mr Putin. One older guy was going on and on, talking at me rather than to me, and he mentioned England, Germany and America several times. I answered very diplomatically as I had the impression that the Russian media had been winding up the populace a bit. I didn’t want to fall foul of resentful international relations. I sent a text to Tanya, whom I’d met in Omsk, but she was too busy with her studies to meet me. I also sent a text to Elena, whom I’d met in Kyrgyzstan. Her son, Dimitry, replied on her behalf and we arranged that he would come to collect me when he’d finished work the next day to take me back to his parents place. I texted Stas again to try to arrange for getting the work done on my bike but got no reply. That left me in a bit of a quandary as I didn’t know whether to wait for him to get in touch or try to sort something out myself. I had information about a bike shop in the city, NBS Motors, which I would go to if all else failed. I would leave it for a day to give Stas a chance to respond to me. I felt it would be a bit churlish to ask someone for help and then go elsewhere before they’d had a chance to act. I spent a bit of time walking around the local shops, picking up some supplies and continued to research my route to, and around, Mongolia. It was all coming together well. Dimitry came round soon after 6pm and took me on the forty minute drive back to their apartment. You’ll often hear about the bad standard of driving in Russia but I have to say that I find Russian drivers mostly well disciplined and considerate towards each other although they do tend to ‘go for it’ as soon as a red light changes to green. I suppose the only thing a bike rider has to watch out for is that drivers will sometimes take advantage of your small size by overtaking you on the inside. Occasionally I’d get overtaken on both sides at once! A cross city journey did nothing to change the general good impression though. 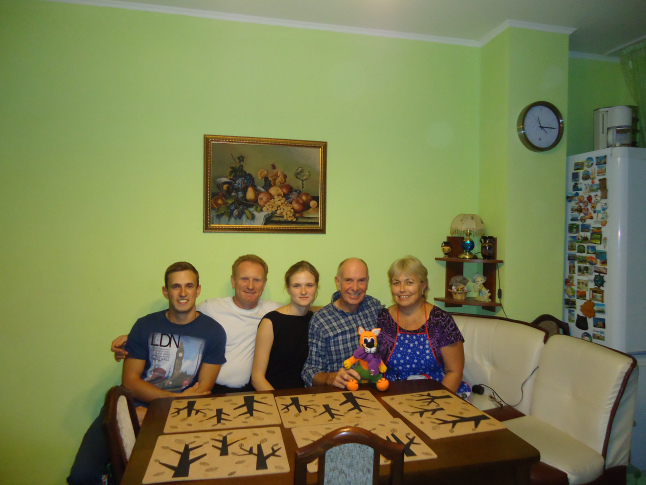 I was welcomed into Elana and Vadim’s home with warmth and pleasure. We were very pleased to see each other again. They live in a very nice, large apartment, clearly decorated with Elena’s womanly touch, and very comfortable. I met Masha, their daughter. She’s at university studying engineering, specifically related to bridges and tunnels. Dimitry, who is twenty four, has already completed the same degree. He has travelled widely, building bridges and tunnels all over Russia and nearby countries. He has now moved on from the construction side and is more involved in negotiation and management. Vadim used to be in the military but is now head of personnel for the local authority. Elena was university educated and works in administration. We ate Palmeni, a Siberian dish and similar to Ravioli. They asked lots of questions about my journey and Dimitry took the details of my blog. I asked Elena if she would have come and spoken to me in Torsor if the others had still been there. She said she had wanted to say hello to me but deliberately waited until I was alone. I rest my case! Vadim asked me which I liked most, St. Petersburg or Moscow? He was surprised when I said Moscow. I explained that I preferred it because it was more related to the real Russia whereas St. Pete, although very beautiful, only related to the history of the Tsars. I discovered some other interesting things. Their pension age is currently 60/55 but they expect that to rise because there are getting to be more old people than young, similar to most of Europe. Students have to pay for their degrees although some will go free on merit. There is a loan scheme but fees are nowhere near as high as those in England and Wales. It seems that some degrees are very specific to the chosen career, which strikes me as a bit limiting. Masha said she is unlikely to do the work her degree relates to. She said she’s not very good at the maths ‘because I’m a girl’. I told her off a little bit saying it was nothing to do with that, it was just the way it was. She seemed to appreciate that. Wages are about two thirds of those of the UK and prices of goods are proportionally similar. 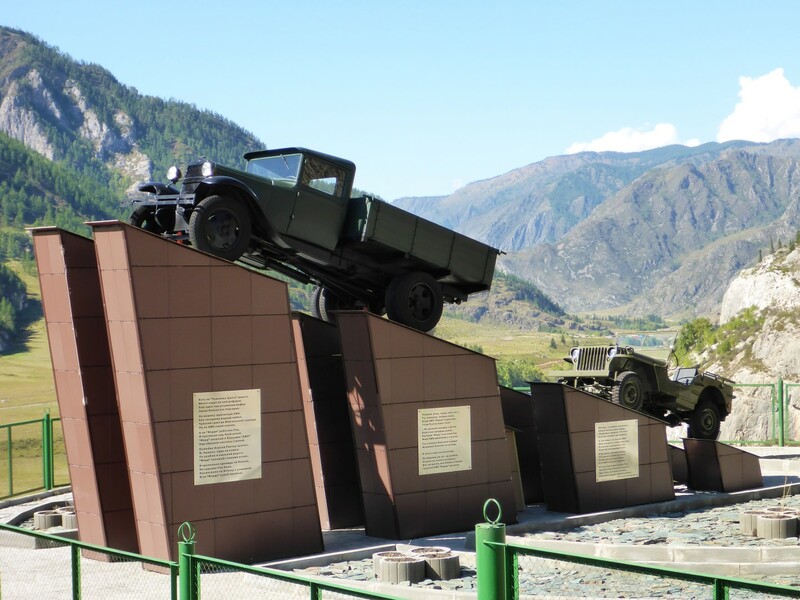 That’s one of the reasons why cheaper countries such as Kyrgyzstan are so popular as holiday destinations for Russians. They were quite surprised at how high the UK average wage is. I said there were many poor people but the average was disproportionately high because of the number of super rich people. They are all happy that Putin took over The Crimea. He is far more popular now than he used to be. I pointed out that leaders with internal problems are not averse to taking external actions that will boost their popularity. They understood what I meant but I’m not sure they agreed with me. Most of the large apartment blocks are heated by District Heating Systems. These tend to be cheaper and more efficient but the downside is they shut them down for maintenance for a week, twice a year. The Gogolev family. Dimitri, Vadim, Masha, Elena. I was very impressed by a piece of technology that Dimitry had on his car. Russian car dealers will install a system that will start the engine automatically at regular intervals to stop it freezing up. Perhaps every two or three hours, depending on conditions. Additionally, the driver can start the engine remotely so the car is warm when he gets out to it. Their apartment is on the 14th floor and the car was parked nearly 100 metres from the main entrance. Before we left Dimitry pressed a button on the remote key fob and when we got to the car it was nice and warm. That’s an amazing range of operation. I imagine similar technology is used in other cold parts of the world too. One final moment of pleasure to recall was when Elena said they were going on a Volga boat cruise next summer and would I like to go with them? I was stunned! What a fantastic offer but I had to turn it down as I expect to be on the other side of the world. But I promised them I would do my best to return for another visit one day. They are all lovely people and it was a privilege to spend time with them. I stayed the night there and next morning Dimitry dropped me back at the hostel. I told him I was going out to look for NBS Motors and he said to call him if I needed any help as he had a biker friend he would contact who he was sure would be able to suggest somewhere that would help me. Later on, armed with an address programmed into my GPS and an English speaking contact at the shop, I went off in search of NBS Motors. As I may have said before, finding Russian addresses is an adventure in itself. Theirs was Dom 27/5, which meant I had to find number 27 on the street and then hunt around for block or unit 5. The first part went well. I located Dom 27 and started the search. And I searched. And searched some more. And then gave up. I’d found some industrial units which were 27/1. Then, nearby I found some huge new apartment blocks, which were 27/2 and 27/3. After that, the trail ran cold. I scouted around everywhere I could think of but to no avail. So I rang Dimitry and asked him to contact his friend for details of the place he had in mind. Dimitry rang me back and gave me details of …….. NBS Motors! I didn’t know whether to laugh or cry but while I was deciding which to choose a guy pulled up in a car beside me and asked me if I was looking for NBS Motors. ‘Yes’ said I. ‘Follow me’ said he. And he led me there. To this day I have no idea how he knew where I was or whether he was sent out by the shop. He didn’t come in with me so maybe it was a lucky coincidence that he guessed what my problem was. I just don’t know. Either way, it was very weird. Sacha, the shop manager, directed me to a small workshop, having first showed me where the jet wash was. Then he left me to it. As before, I bought oil and other necessary items from the shop but that was all they wanted me to do. No payment was required for the use of their workshop. How fantastic. How generously Russian. 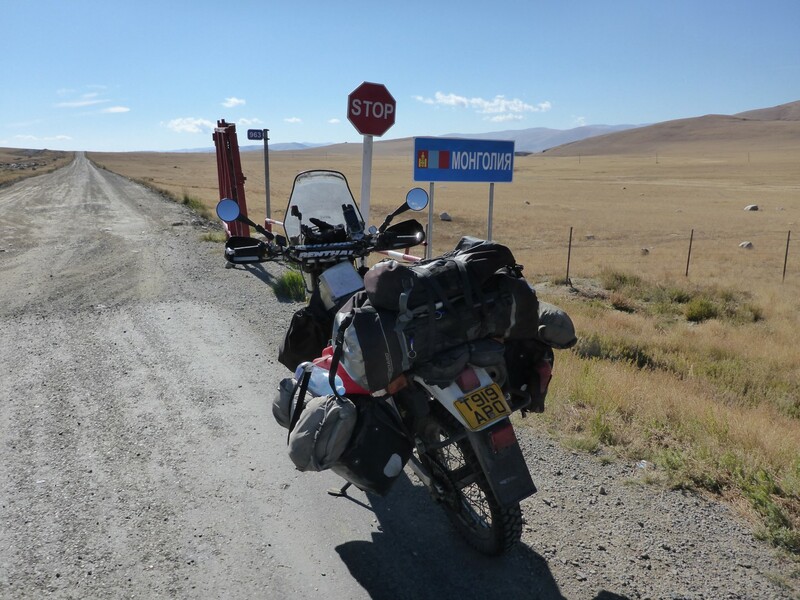 I was now all set for my journey into the wilds of Mongolia, meaty front tyre fitted and gearing lowered ready to cope with those tough Mongolian trails. I texted Dimitry to let him know that all went well. Apart from the reply to my first text, I never heard from Stas again. A roadside memorial of some kind. I’ve no idea who to though. Setting off next day, I stopped to fill up and noticed that the garage had a car parts shop next to it. They sold me a five litre petrol can so now I was re-equipped with a means of carrying spare fuel. I was a happy bunny. It took two days to ride south to the border. 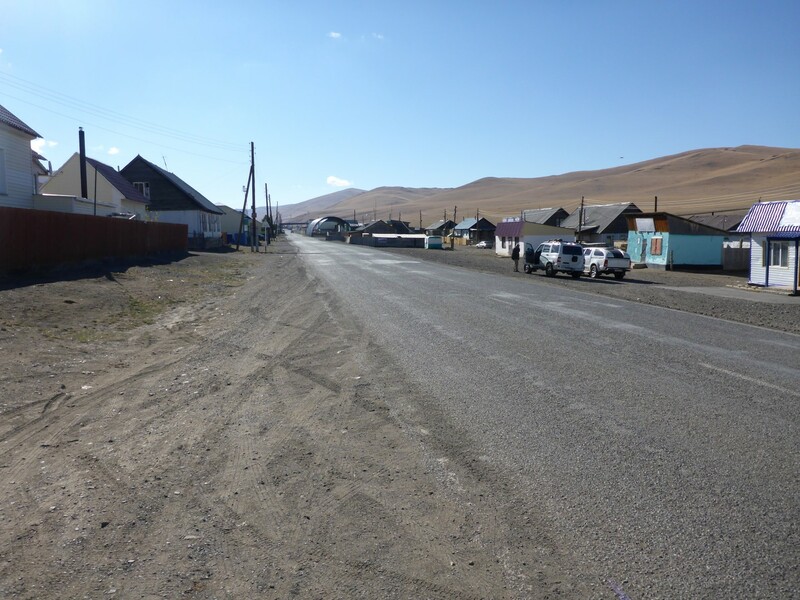 It was only a brief journey from the hostel to the main road out of Novosibirsk and then it was a straight road, mostly single carriageway and 1,00kms long from Novosibirsk to the Mongolian border and beyond. This scenario never ceased to amaze me. This city boy just isn’t used to roads that never seem to end. But it certainly makes navigation easy. I stopped for a bite at a very modern, self service café, very much like a motorway service station. It made me think that this must be a tourist route and that was borne out by the place in which I stopped for the night. I’d by-passed the city of Barnaul and south of there was an area of rivers and lakes that was very much a holiday centre. The buildings and businesses were clearly focused on the holiday trade, with bars, restaurants, hotels and holiday complexes everywhere. In the villages there would be large pull-ins at the side of the road with small stalls selling all kinds of supplies and trinkets. It was probably a bit late in the season but there was still plenty of activity. 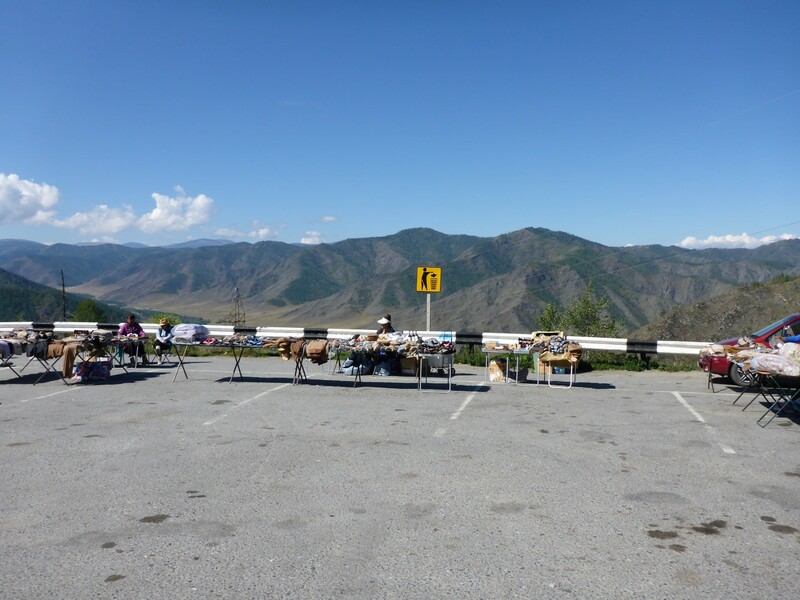 Souvenir sellers on a lonely hilltop. The nature of the road had changed too. It now wound its way around hills and valleys, crossing fast flowing rivers on its way. No more straight-as-a-die boredom. There was bend swinging to be done and fun to be had in the process. I’d identified, but not booked, a place to stay and I turned off the main road into the village of Aya to search for it. And I had to search too. The address gave a number on the main road but needless to say it was actually along a back road that ran parallel. Why was I not surprised? But it was a very nice, wood constructed house and the fee included a very nice breakfast. An Alpine flavour to this lakeside house. The road and scenery continued to be very pleasant but after about 200kms things started to change. I could see mountains ahead and the country gradually got drier. Treeless, rocky hills and dry valley floors. As I passed through some of the valleys I was puzzled by the fact that the hills on one side of the road would have a thick covering of trees and those on the opposite side had none, not one. I could only guess that the wind must blow the soil away from one side but not the other. 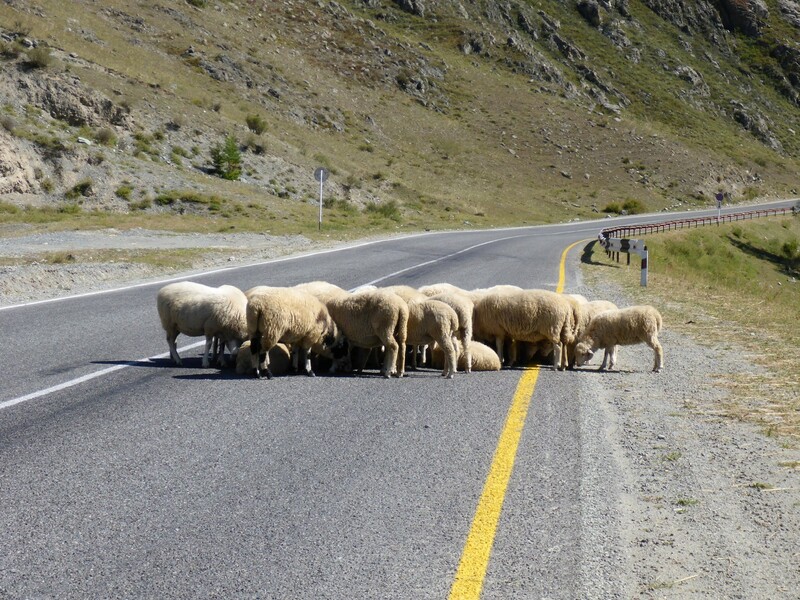 I wasn’t completely alone on the road. The border is at a place called Tashanta, which is 20kms from a place called Tashanta. Both are shown on my map. I reached Tashanta No.1 at 17.40. There was the border post, even though the map shows it at Tashanta No.2. Strange. I approached the border guard and he sent me back up the street to an unmarked office to get my passport checked. I went back to him and he told me the border closed at 6pm. I’d guessed as much from the way he’d been looking at his watch earlier. I went and found a café and had some food. I asked the woman about a hotel, not really expecting there to be one in this small and very drab border village. She told me to go to the other café back along the street and ask there. I did that and the woman there directed me to a house across the street, painted the same nice blue and white as the café. They were both owned by the same person and she was there to greet me and show me to a building out the back that had a kind of lounge area and another room with five beds in it. It was a cold night in a room with no heating although fortunately there were plenty of blankets. A Russian guy of about my age arrived at 10pm. We chatted a little. He was on his way to Mongolia too but didn’t have a car. He seemed to be about to tackle the country by bus and taxi. I got the feeling he was retired too and was doing a bit of travelling. I went across to the café for a nice, cheap breakfast. No milk for the tea though, the cows had yet to be milked. I smiled at that. 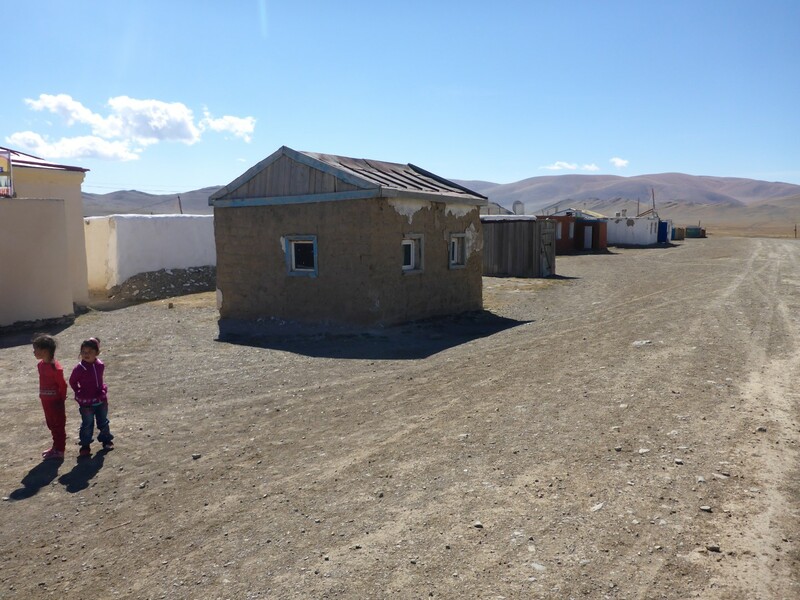 I also reflected that the border post being closed may have done me a favour as I’d otherwise have been in Mongolia, looking for a place to stay, possibly with no Mongolian money. At least I was familiar with the ropes on the Russian side. Things went smoothly at the border but I had a bit of luck to be thankful for. Russian customs asked me for the form relating to my bike and he was very specific about wanting it. When I finally left Kazakhstan I had intended to clear out all the paperwork I didn’t need any more, a kind of ‘Bonfire of the Insanities’ such was my joy at leaving their bureaucracy behind. Luckily I didn’t. As already mentioned, Russia and Kazhakstan share a common customs area so the vehicle customs form for one is valid in the other. When I told him I wasn’t given a Russian one when I entered from Kaz, he asked me for the Kazakh one, the one I almost threw out! Phew, that was a close shave. They also looked inside one of my panniers, which puzzles me considering I was leaving, not entering, the country. They also asked me if I had any drugs or firearms, something that’s happened before. If anyone did, would they own up? Leaving there I eventually came to the answer to the Tashanta/Tashanta puzzle. It was 20kms further down the road before I came to the final Russian passport check, at which point I entered no-man’s-land. The crafty Russian officials based their activities in a civilised town rather than in the wilds, 20kms outside it. Very sensible. 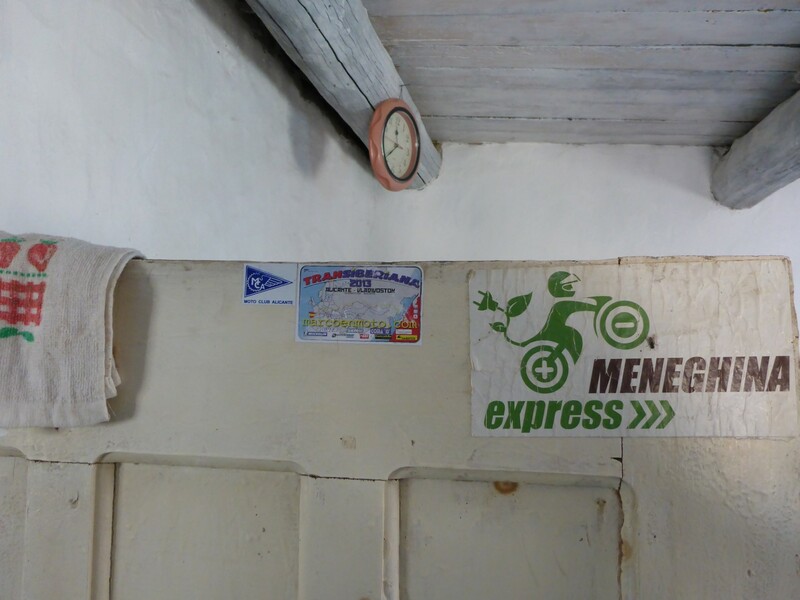 It didn’t take long to get into Mongolia. A woman stopped me at the entry point and relieved me of RU50 for the dubious privilege of disinfecting my wheels. She also changed some money for me at forty five Togrug to the Ruble. A pretty poor rate but I knew I’d need some. As soon as I left the border post a guy waved me down, indicating I should pull in to a red STOP area. He wasn’t wearing a uniform, and didn’t look like an official, but you never know so I complied. He was selling insurance and the crafty so-and-so just wanted to be sure I didn’t pass by without buying it. I didn’t mind as a month’s worth cost just over £4. Good to have even though I was confident it would never get asked for. The other side of the border wasn’t any better. Other bike travellers have used this money changer too. I stopped at a café to find it closed and a young guy indicated I should follow him to a different one. This place was actually another ‘border flop house’, albeit a much warmer one. I was presented with chai and then asked if I wanted to change any money. Ah, now we come to the real reason for the attention. Well as it happened I did. He initially offered me the same rate as the disinfectant woman had, 45/1, but I talked him up to 48/1. When I offered him a 5,000 rouble note he was a bit taken aback and had to go and find Big Daddy and get him to open his treasure chest. The chai was free though. And so begins the Mongolian adventure.